Tumbler schmumbler, if you’re an old fart like me then there can be only one true batmobile, and that’s the one from the super-camp 60’s TV show starring Adam West and Burt Ward! As many of you know, this year marks the 75th anniversary of Batman, and than means we’ve seen a lot of new LEGO sets and fan builds celebrating the Batman franchise. 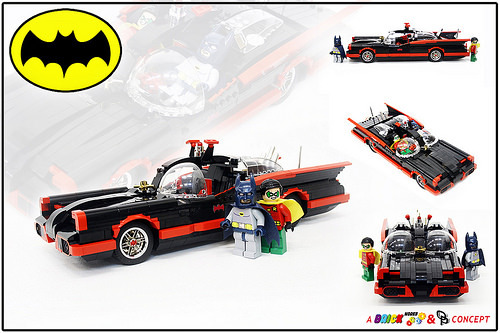 Including one rather disappointing attempting by the LEGO company to create an exclusive “chibi” batmobile for ComicCon. So many thanks to Orion Pax for rectifying the situation with this super-accurate version! And you can check out the full gallery of images over on Mr P’s website here. So you had space in the review to take a dig at the adorable SDCC Batmobile, but no space to mention the most interesting thing about this model — that it’s built to scale with the LED key lights, and uses them in place of regular minifigures? Stellar model, but it’s a shame you sort of ignored one of its coolest features in the writeup. It’s a great model, but it seems a little big -the original wasn’t taller than Batman. To be fair, though, that may be more an issue with the scale of minifigs than the scale of this model.